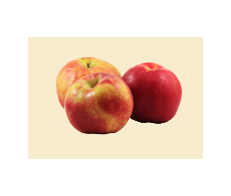 The Gravenstein apple is an incredibly hard to find varietal due to the difficulty farmers have cultivating it. In addition to contending with a very finicky tree, it\’s also not an apple that travels or stores well, so it is best enjoyed during its relatively short season and isn\’t typically shipped far. It\’s grown in pockets up the coast of Northern California and prized for its amazing ambrosia perfume, and crisp, sweet-tart cream colored flesh. Our Gravenstein Apple White Balsamic marries the complexity of the Gravenstein\’s larger than life flavor with our well balanced Ultra Premium White Balsamic Vinegar from Italy for a delectable culinary symphony. And as always it is All Natural, has no artificial flavors, no thickeners, no added sugar, no caramel color or dyes, no artificial flavors or additional ingredients whatsoever!